I have yet to get some pictures of my new culottes, so in the meantime I’m sharing some details from a dress I’ve been making. 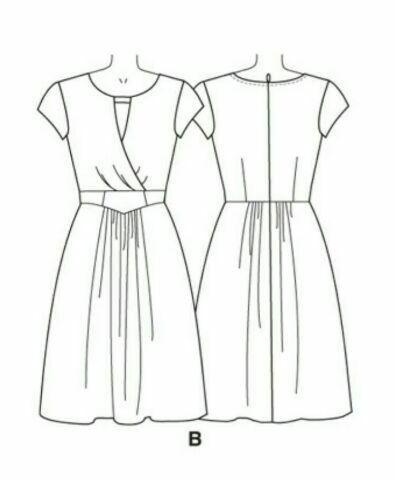 It’s a Lisette dress from Butterick – B6168. 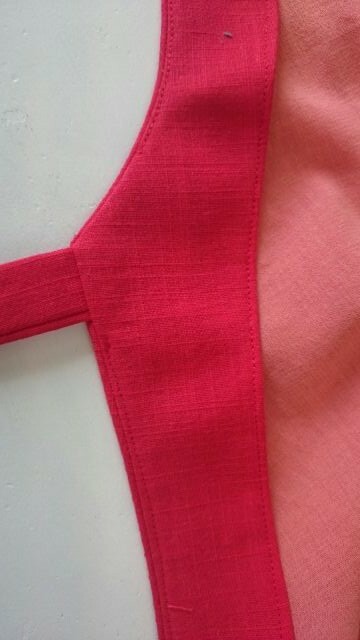 There is a detailed sew-along on the Lisette site, but their version is unlined. So because I’m lining my dress, some pictures might be helpful for anyone who wants to add a lining. 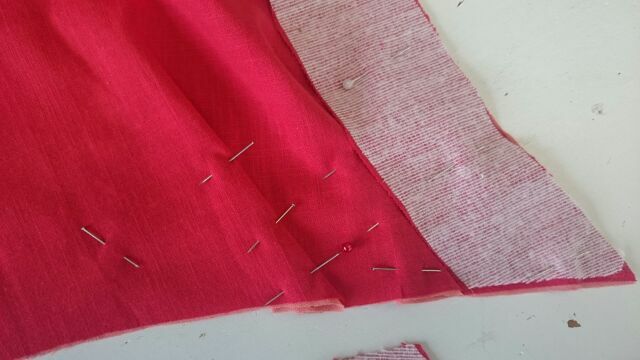 My main fabric is a red linen-look cotton, I bought it locally as the end of a roll. Minerva Crafts looks to have something similar for sale (I’ve sent for a sample and, if it is the same fabric, I might buy some for a light summer top) . 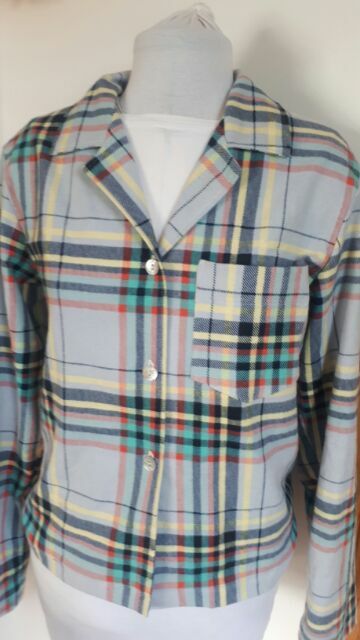 It is quite lightweight, so I am lining it with a lightweight cotton that I had lying around. 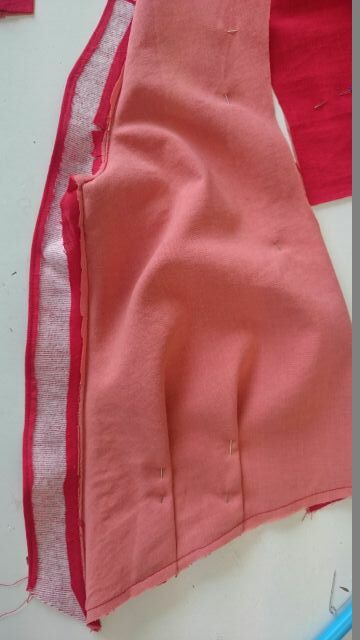 There are centre front pleats which could make lining it bulky, so the front bodice panels are actually underlined ( both fabric are tacked together and then treated as one piece). 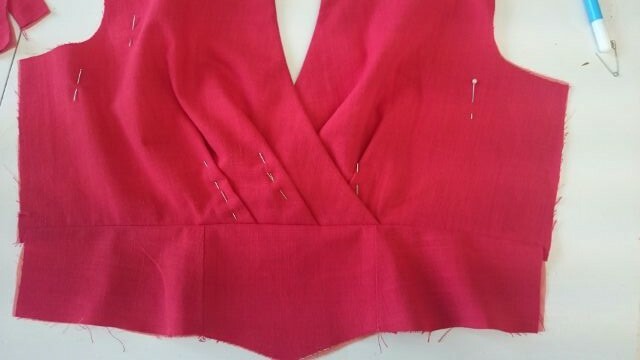 The pleats are then folded and held in place with pins or tacking stitches. I made a quick muslin of the bodice and it fit well – so if you’re above a b-cup, you would most likely need to alter the pattern first! I am working on it in small chunks of time in between other work and it is coming together nicely. I’ve also cast on a new knitting project!!! I’m determined to have some new knits ready in plenty of time for next winter. All the fantastic entries from SWAP 2015 must have inspired me to start planning my projects ahead of time!! Love the style of that dress! And a fab colour. Underlining is a good solution when conventional lining may not work. I’ve seen Kate’s work for the 2015 SWAP and it as absolutely fab, she’s lifted the bar very high for 2016! I used to wear alot of red so looking forward to adding it to the wardrobe! I’m working on this dress right now too! 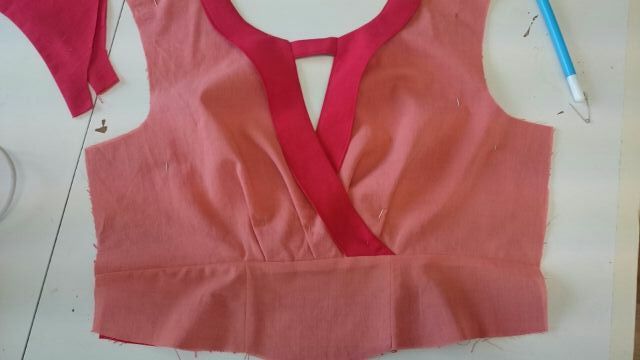 I’ve cut the bodice in a cheap cotton to test the pattern, I hope to have it finished by the end of the week. I want to line the skirt and finish the back neckline with a proper facing. Are you going with the bias facing? I have to check out SWAP, I have no idea what that is. I didn’t use the bias facing, instead I’ve lined the back bodice as well. I should be able to post more pics tomorrow. I had often seen Swap mentioned but didn’t have a clue what people were on about until recently! The inside of your dress is beautiful! 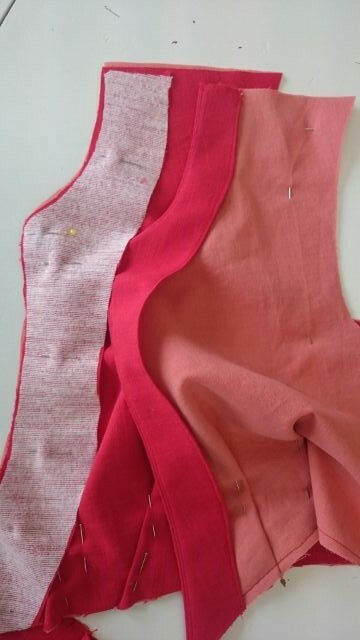 I like your red linen/cotton better than the oatmeal linen I made my version from. Can’t wait to see the finished dress….